Java String format() method is used for formatting the String. There are so many things you can do with this method, for example you can concatenate the strings using this method and at the same time, you can format the output of concatenated string. 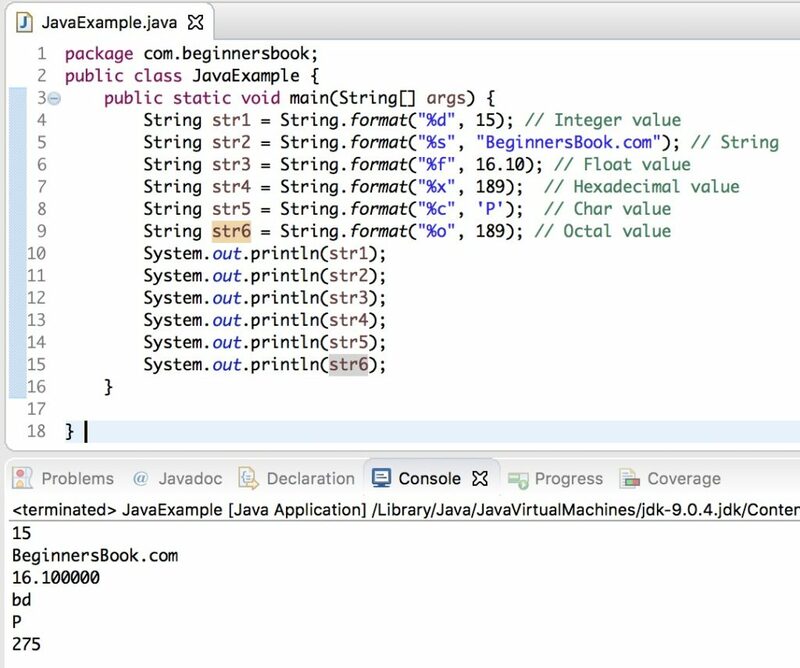 In this tutorial, we will see several examples of Java String format() method. We can specify the argument positions using %1$, %2$,..format specifiers. Here %1$ represents first argument, %2$ second argument and so on. As you can see that how we have passed the string “cool string” twice in the format() method using the argument positions format specifiers. In this example, we are left padding a number with 0’s and converting the number to a formatted String. In the above example we have formatted the float numbers and Strings and in this example we are formatting an integer. The important point to remember is that the format specifiers for these are different. * into a String using Java String format() method. In the following example, we are using different format specifiers to display values of different types. Here we have shown few examples of how an integer value can be converted into an octal or hexadecimal value using format() method. After this example, we have shared a list of available format specifiers.